Heat the oven to 400°F. Stir the goat cheese, parsley, chives, Parmesan cheese, black pepper and lemon zest in a medium bowl. Spoon the cheese mixture into a pastry bag or a resealable plastic bag with one corner cut off. Sprinkle the flour on the work surface. Unfold the pastry sheet on the work surface. Roll the pastry sheet into a 10-inch square. Cut into 4 (2 1/2-inch) strips. Cut each strip into 6 (3x3x3-inch) triangles. Discard any remaining pastry. Press the pastry triangles into the bottoms and up the sides of 24 (1 1/2-inch) mini muffin-pan cups. Using a sharp knife, cut an "x" across the top of each tomato, cutting through from the top to about halfway down. Pipe about 1 1/2 teaspoons cheese mixture into each tomato. 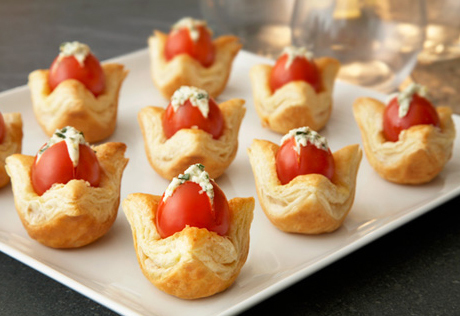 Place the tomatoes in the center of the warm pastries and press down lightly. Bake for 5 minutes or until the pastries are golden brown. For Sweet Berry Jewels: Stir 1 cup whipped cream cheese, 3 tablespoons confectioners' sugar, 1/2 teaspoon vanilla extract and 1/2 teaspoon lemon zest in a medium bowl. Prepare the pastry sheet as directed above but bake the unfilled pastries for 12 minutes or until golden brown. Let the pastries cool in the pans on wire racks for 10 minutes. Spoon about 1 1/2 teaspoons cream cheese mixture into each pastry. Top each with 1 fresh raspberry or blackberry. Time-Saving: Save time by substituting about 3/4 cup garlic & herb spreadable cheese, softened, for the goat cheese, parsley and chives.